Tour a selection of the Outer Banks&apos; many historical and cultural attractions including the Elizabeth II, a replica of the vessel used to sail to the New World, the Elizabethan Gardens and finish with a performance of the Lost Colony Outdoor Drama. 9:30am Roanoke Island Festival Park (2 hours). Here you will see the Elizabeth II, a 69-foot sailing vessel representative of t hose sailed to the New World in 1585. Also we will visit the Roanoke Island Adventure Museum and Settlement Site where you can see what life was like for those early explorers as they arrived on Roanoke Island. 11:30am North Carolina Maritime Museum and Roanoke Marshes Lighthouse on Roanoke Island (1 hour).Located on the Manteo Waterfront this museum is also known as the George Washington Creek Boat Shop. This working boat shop shows visitors the age- old form of boat restoration and construction. The replica of the 1850s screw- pile light that once stood guard over nearby Croatan Sound, will offer visitors a unique glimpse into the maritime history of the island, as well as the lightkeepers who once lived at the station. 12:30pm Lunch, the waterfront of Manteo is a great spot for lunch on own, lots of sandwich shops and cafés with in walk distance of each other. 2:00pm Fort Raleigh National Historic Site and Backstage Tour of Lost Colony (1 hour). Sir Walter Raleigh’s explorers and colonists attempted to found settlements here on the north end of Roanoke Island in 1585. Also located here is the Roanoke Island Freedman’s Colony. The colony is recognized as an historic National Underground Railroad Network to Freedom site. The Waterside Theatre is also on site, where you will find The Lost Colony, a symphonic outdoor drama. You’ll also find a visitors center, interpretive programs, bookstore and nature trail. 3:00pm Elizabethan Gardens (1 hour). Stroll through the majestic gardens, which were designed as a living memorial to Queen Elizabeth and the Lost Colony. A highlight of the gardens is an outstanding collection of antique statuary. 4:30pm North Carolina Aquarium on Roanoke Island Aquarium (1 hour). 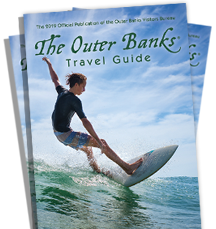 Learn about the “waters of The Outer Banks” and its many coastal environments on these barrier islands. See the aquarium’s 285,000-gallonGraveyard of the Atlantic tank. 6:00pm Dinner, be sure to choose from one of our locally owned restaurants, which feature North Carolina Seafood.